For thoseatrisk of extradition, CLP Solicitors providesa reassuringly strong line of defence when it is most needed. Global communication networks and the growing ease of cross-border travel have led crime to become more international than ever. As a result, different national police forces are increasingly cooperating, and it is becoming more common for one country to seek to extradite an individual from another country for investigation or trial. If you are being investigated or charged in an overseas jurisdiction, then extradition could be a very real risk for you. In particular, if you visit any country that has entered into a formal agreement with the investigating jurisdiction, you could face detention and/or deportation. As such, it is important to seek reliable and expert legal advice. At CLP Solicitors, our team of legal professionals have expert knowledge on extradition law and can provide accurate advice on where you stand and what your options are. Our legal team can advise on your exact legal position, both in the UK and in the jurisdiction where you face possible charges, and we can help assess the level of threat that extradition poses as well as the safety of any travel plans that you might have. At CLP Solicitors, our solicitors have an excellent track record of providing sound advice, assistance and advocacy to clients facing extradition. We give our clients the help they need at every stage of proceedings, from the moment of arrest through hearings and appeals in magistrates courts and Superior Courts. We use a firm grasp of both extradition law and the facts of each individual case to ensure we do everything possible to fight extradition and, where extradition proves unavoidable, obtain the best outcome possible. CLP Solicitors has an excellent track record of dealing with even the most complex extradition cases. 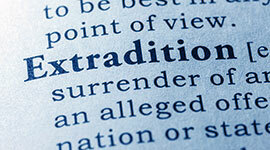 Please see the Notable Cases page for more information about some of the extradition proceedings we have successfully handled in the past. If you would like to find out more about the services we can offer or discuss your own case with a member of our team, please contact us immediately. Providing clarity and defending you from extradition.